Information and references on every soldier known to have served with the 2/2 Pioneer Battalion during World War 2. Families are encouraged to Contact us if they have additional information, photos, etc to add to the website. The alphabetical selection box at the top of the scroll window allows selecting of A to Y (surname lists), ? (a random display of profiles, repeated clicks immediately show other profiles) and S/No. (a list of every service number used by any Pioneer, including multiple numbers). Click on any small photo icons on the Soldier profiles webpage to display the larger image. There are many photos on the webpage and this method saves large download times for users with a slower internet connection. Name : official records may show eg. Mac as Mc (and vice versa). It may be necessary to look for known variations of names. Also, at least seven Pioneers served under an alias (Jack Attwood-Kimber enlisted as Jack Kimber, Charles John Balunas enlisted as Charles John Noble, George Bennett enlisted as George Jennings, Christopher Burns enlisted as Albert Joseph Burns, Fred Carney enlisted as Frederick John Snackenberg, Vance Llewellyn Foley enlisted as Frederick Green and Hugh McLean enlisted as Thomas Spiken). Service numbers : some men, especially those who enlisted early, had multiple numbers (the least often referred to are in brackets). Click S/No. to select from a profile list of every service number used by any Pioneer, including multiple numbers. "X" in the service number meant a 2nd AIF designation : DX = Darwin (Northern Territory) enlistment, NX = New South Wales enlistment, QX = Queensland enlistment, SX = South Australia enlistment, TX = Tasmania enlistment, VX = Victoria enlistment, WX = Western Australia enlistment. Those numbers that do not fit this standard are referred to as Irregular. Service Number Summary. Age and date of birth : stated ages and the truth could be out by many years. On paper, no one seemed to grow older than 39 years (Private George Roach was 57 years old on enlistment). Others put their age up (Private "Bluey" Kelly was probably the youngest at 15 years of age). Note that date of birth was initially sourced from the Nominal Roll and may be incorrect (up or down). Some birth dates have been confirmed to be wrong and corrected using headstone and / or family information. Place of birth : spelling errors have been corrected for Australian towns (some were unable to be found in town lists; they may have had their name changed or even not exist now). Rank : as listed at time of discharge / death. P.O.W. camp : although most soldiers did go to multiple camps, usually only one reference has been found; additional information has proven very difficult to find (but the search continues!) Another complication is that service records rarely listed P.O.W. camp information. Applicable Australian War Memorial circulars : official documents such as Prisoner Of War / Missing Status Circulars, Death Circulars and Award Circulars. See `References found' below regarding photos. Note that soldiers were often buried then moved to a more central / larger cemetery later, so Death Circulars made at the time may record an out of date burial location. Abbreviations specific to the Prisoner Of War / Missing Status Circulars are B (Borneo), Co or Coy (Company), Fu (Fukuoka, Japan), IRC (International Red Cross), J (Java), M (Malaya), MB (Moulmein, Burma), MBD (Missing Believed Dead), MBP (Missing Believed Prisoner), Msg (Missing), PW (Prisoner of War), PWBD (Prisoner of War Believed Dead), Th (Thailand). Additional abbreviations are on the Glossary webpage. References found : entries (typically books or newspaper articles) and photos found during web searches and from other sources. Clickable entries are of references stored on this website, (for example photos and submitted soldier stories). 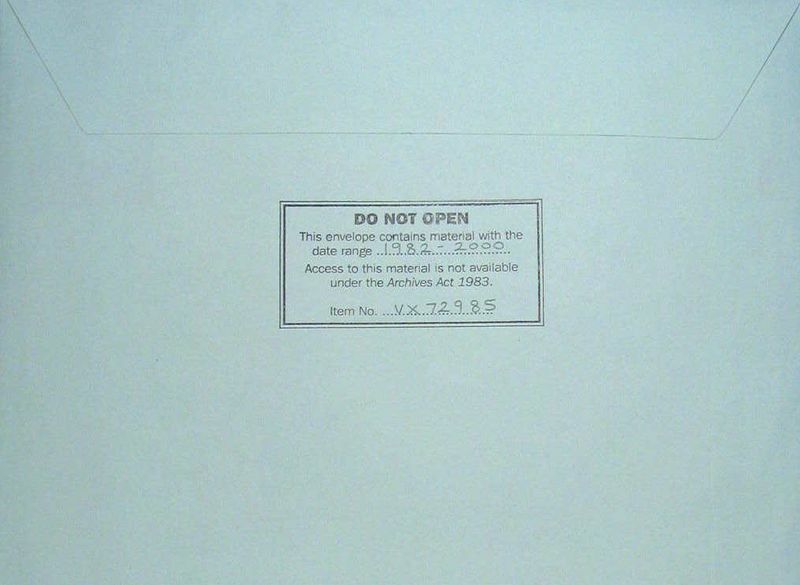 The National Archives of Australia (NAOA) provide restricted access to public records. Generally, records are time sealed. They define their entries in several ways : NOT EXAMINED (the record exists but has not yet been assessed for public access availability), OPEN (the record exists and can be viewed at the NAOA), OPEN WITH EXCEPTION (where some information has not been released under sub-section 33(1)(g) of the Archives Act 1983), DIGITISED (the record exists and can be downloaded from the NAOA website) and CLOSED (the record exists but is not available for public access). Typically, the first barcode listed in references is for the soldier's service record. Use the barcodes to search the NAOA website for more information. Some NAOA entries are marked NO ENTRY FOUND to flag our unsuccessful attempts so far to find that soldier on the NAOA website. A `P' at the end of a photo entry (for example, NAOA_NX34283-P.jpg) is usually a photo from a digitised service record at the NAOA showing the soldier at enlistment. This is often the one used for any `photo of the time' displayed in profiles. Photos (front and side) were normally taken on enlistment and placed in the service record. Background : general information about the soldier including their service record (sample record of S. R. Linklater). Many profiles do not have a service record summary as yet. Deciphering the abbreviations and faded writing is very time consuming and it may take years to enter over 2,800 records into the profiles. Note that some medical entries and any court martials, correction entries or deletions within the soldier's service record have not been transcribed. 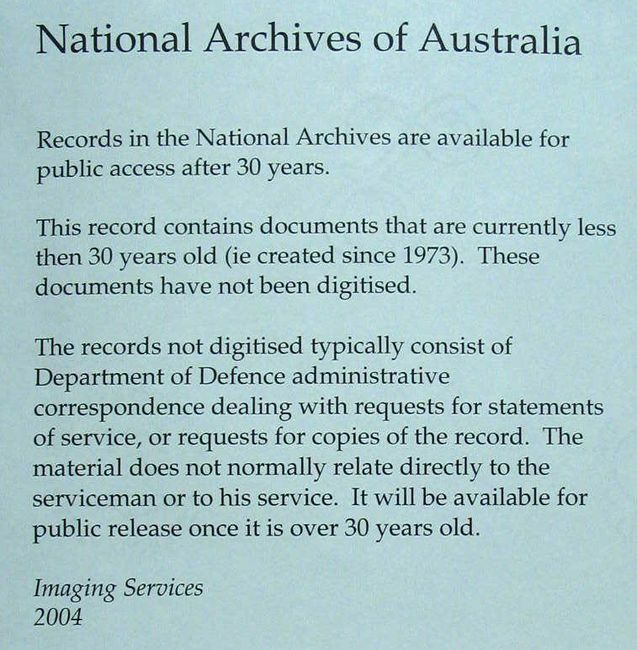 Priority will be given to entering available DIGITISED records on the National Archives of Australia (NAOA) website or hard copies donated by families. NOT EXAMINED entries take months to be cleared for public access and then are classed as OPEN. Entries can be DIGITISED by the NAOA (after a digitising charge is paid), placed on their website and then are freely downloadable by anyone. A VERY expensive exercise that may need a Government grant in the future.